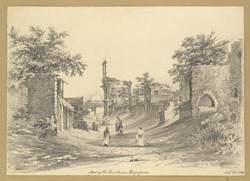 Pencil drawing of a street in Bijapur, Karnataka by Alexander Nash (fl. 1834-1846) between 1844 and 1845. This image is from an album of 19 drawings depicting the monuments of Bijapur and the hill forts of Dejouri and Purandhar, made during a Revenue Survey of the Deccan. Nash served with the Bombay Engineers and from 1836 was mainly employed in the Revenue Survey of the Deccan, first as an assistant and from 1841 as Superintendent. Bijapur is located in Karnataka in the south of India. The city was established by Chalukyan dynasty of Kalyani between the 10th and 11th centuries and originally named Vijayapura or the ‘City of Victory’. From 1489 until 1686 it was the capital of the Adil Shahi dynasty and enjoyed a period of great prosperity when many splendid mosques and tombs were constructed. The golden age of Bijapur ended upon its conquest by the last great Mughal ruler Aurangzeb. After this time the town declined so that it now occupies less than half the area it once did. The original city walls, however with a circumference of over 10 km survive to give some idea of the city's original importance. These massive walls containing five gateways are surrounded by a moat and protected by ninety-six bastions.